Dennis (fifth right, standing) and Mackos (fourth right, standing) posing with the villagers after inspecting the second damaged suspension bridge. 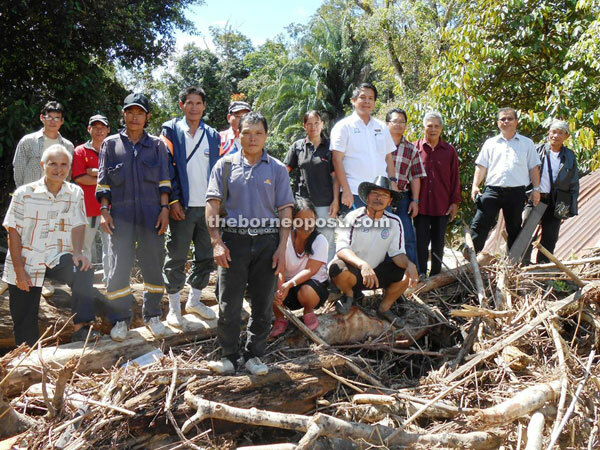 MARUDI: Telang Usan assemblyman Dennis Ngau and Marudi district officer Mackos Sibong, who is the Baram District Disaster Relief Committee chairman, recently visited two Kelabit longhouses at Long Peluan and Long Banga in Upper Baram that were hit by flood on Jan 18. They went there to check on the extent of damage caused by the flood and to attend to the people’s needs. According to Long Peluan chief, Tuloi Bayo, among the things destroyed by the flood were the three suspension bridges that they used to cross the Peluan river to their farms, and the solar energy system besides the pipeline from the water catchment area to their longhouse. He said the flood was 10 feet high, the worst and highest that had ever occurred in Long Peluan. Fortunately, he added, the water only entered the lower part of their longhouse. Meanwhile, Dennis told the villagers that the government through the District Office would soon repair the suspension bridges. Mackos, on the other hand, advised the villagers to list down their damaged properties including their destroyed paddy fields and submit the list to the District Office for filing compensation claims. Separately, the Penans of Long Beruang, who were also hit by flood, said some of them lost gunny sacks of paddy that were washed away by the flood waters. One of them even told the district officer that about 200 of the fish in his fish pond were swept away by the flood.